On July 14, 2011, the bill H.R. 2527 National Baseball Hall of Fame Commemorative Coin Act was introduced by Rep. Richard Hanna of New York. If approved, the Secretary of the Treasury would be required to mint and issue commemorative coins to recognize and celebrate the 75th anniversary of the National Baseball Hall of Fame in Cooperstown, New York. There are currently 293 cosponsors to the bill, suggesting a high likelihood that it will pass. The commemorative coin program would include up to 50,000 $5 gold coins, up to 400,000 silver dollars, and up to 750,000 half dollars to be issued during the one year period beginning on January 1, 2015. Both proof and uncirculated versions would be produced. The legislation instructs that any facility of the United States Mint may be used to strike the uncirculated and half dollar coins, while the remaining coins would be struck at the West Point Mint. Designs for the coins would be “emblematic of the game of baseball and its place in American sports and the American way of life.” The obverse design would be selected through a competition judged by an expert jury chaired by the Secretary of the Treasury and consisting of three members of the Citizens Coinage Advisory Committee and 3 members of the Commission of Fine Arts. The reverse design of the coins would feature a baseball. The bill also suggests that the coins be minted in a fashion similar to the 2009 International Year of Astronomy Coin from the Monnaie de Paris, with a convex reverse to resemble a baseball and a concave obverse for a dramatic display of the design. Sales prices for each of the coins would include a surcharge distributable to the National Baseball Hall of Fame. The surcharge amounts would be $35 for each gold coin, $10 for each silver dollar, and $5 for each half dollar. In order to become law, the bill must be passed in the House of Representative and the Senate and then signed by the President. There have been several baseball themed commemorative coins previously issued by the United States Mint. The silver dollar issued for the 1992 Olympic Games featured a baseball pitcher on the obverse. One of the 1995 Olympic Half Dollars depicted a baseball batter, catcher, and umpire at home plate. Finally, a $5 gold coin and silver dollar were issued to honor Jackie Robinson, the first black MLB player, Rookie of the Year, and Hall of Famer. 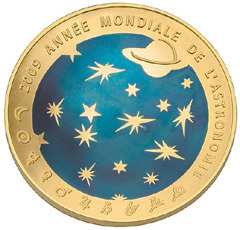 I like the idea of emulating the 2009 French astronomy coin, but the mintage levels seem too high, esp. for the dollars and halves.